Sleeper chairs are an innovative option for older adults, especially seniors choosing to age at home. They allow for optimal comfort and versatility that can alleviate the aches and pains that come with getting older. Sleeper chairs for adults provide a viable alternative to a traditional bed, and they offer more features than most beds. Plus you can place this type of chair in any room you want to relax in to enjoy the benefits. Find the perfect sleeper chair by exploring the options available. Then, check out the different features and considerations. There is a lot to learn to ensure the best decision, and we want to help to make this simpler for you. Here are six of the best sleeper chairs for adults. 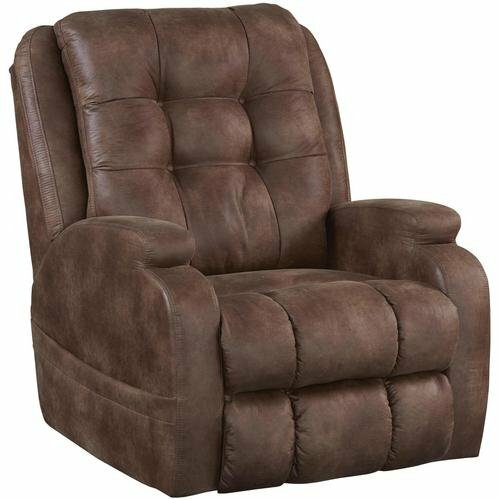 This chair allows for easy exit and entry, as well as automatic reclining. The design of the Med Lift 5500 Wall-a-Way 3-Way Reclining Lift Chair is ideal for taller people and smaller spaces. You can place this chair within three inches of a wall and still enjoy full reclining adjustability. Those up to 6’4” tall can comfortably relax in this chair without their feet hanging off of the footrest. While an extremely comfortable sleeper chair, it also serves as a fantastic lift chair. The chair gently reclines or rises with simple button controls. 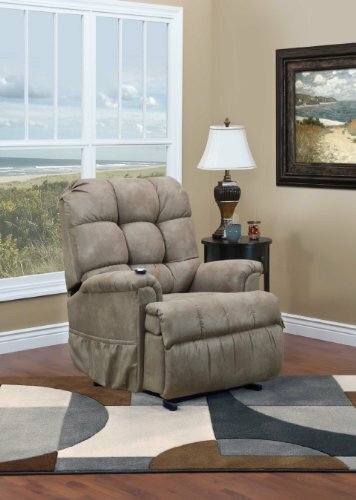 The transition from standing to reclining is smooth and quiet with the chair’s electric motor, which is ideal for seniors who require comfort as well as assistance getting up and down. The chair has a biscuit back design, padded roll arms and a padded chaise footrest to ensure optimal cushioning and comfort. The padding retains its shape with frequent and prolonged use. And seniors can keep essential items nearby in the attached side pocket. This reclining chair provides a full lay-out. Fully recline for sleeping or choose from a multitude of heights for reading or watching television. The reclining function is quiet and smooth during operation. The Catnapper Power Lift Full Lay-Out Recliner features a contemporary style, durable fabric, and construction materials. 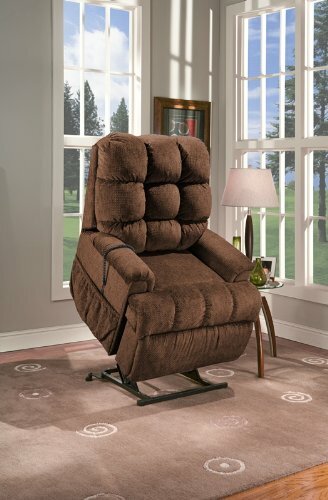 It fully reclines for sleeping or you can choose from a multitude of heights for reading or watching television. The reclining function is quiet and smooth during operation. The style and design of the chair make it easier to get in and out of as well. The seat box is hardwood with steel joints, ensuring durability and heavy-duty capabilities. The fabric is a combination of polyester, cotton, and acrylic; this combination makes it breathable and quick to clean. The chair’s motor makes it possible for you to adjust the ottoman and the back separately for maximum versatility. The gel-infused foam provides comfort and prevents pressure points on the body. It also reduces sagging and low spots in the seat. The roll pad arms are plush, keeping arms comfortable in all positions. Our only concern for seniors is it may be too comfortable to get out of. Seniors who need help getting into or out of a chair can benefit from the Med-Lift 5555 Full Sleeper Lift Chair. The chair gently reclines or rises with one button, allowing for optimal independence. The design of this chair is ideal for sleeping and super comfortable for seniors suffering with chronic pain. It adjusts to multiple recline levels, including a full sleeping position. The pillow top arms, biscuit-style back and padded chaise footrest ensure optimal comfort. One button is all that is necessary to control the reclining level of the chair and you can store the remote to the chair or television, reading materials and other small necessities in the convenient side pocket. This chair features a battery backup, so it is possible to operate the chair if the power goes out. The fabric in the back is odorless, non-allergenic and dustless conjugated fiber. The padding retains its shape, allowing for solid cushioning. Provides power lumbar support and a power headrest. For seniors with lumbar issues—especially those who have trouble sending in a regular bed— we recommend the VivaLift Perfecta Lift Chair. It offers solid low back support, and you can extend the footrest, making this chair ideal for people of varying heights. Plus its height makes it easier getting up and out of it. The chaise element has full padding. The lumbar pillow and adjustable head ensure that you can relax in the most comfortable way possible, even if back pain is an issue. The VivaLift Perfecta Lift Chair comes with a USB charging port that is part of the hand control, making it easy to charge a cellphone or tablet. The hand controls allow you to easily adjust the reclining level of the chair to read, watch television or sleep. The fabric is easy to maintain and keep clean. The backup battery is a lithium type, which is a durable addition to this chair. The reclining feature glides smoothly, so it is not jarring when you are adjusting the chair. The fabric is a durable 36% polyester and 64% acrylic. Accidents happen whether it’s spilling a beverage or medical conditions relating to incontinence, so we’ve chosen The Reliance Full Sleeper Lift Chair as a top pick for comfort as well as stain resistance. It’s construction and style makes it easy and safe for seniors to get into and out of the chair due to the gentle lifting feature. The thick padding and soft fabric ensure optimal comfort. The fabric is a mixture of polyester and acrylic, guaranteeing excellent stain resistance against spills and incontinence. This chair offers multiple positions, making it easy to sleep in and get comfortable to watch television or read. The full sleeper mode adjusts so that the chair is entirely flat. You have the option to add heat and massage to your chair order as well. These optional features allow you to soothe achy joints and muscles while you relax. The size of the chair is ideal for those of average size. It is not too tall, so even shorter seniors can safely get into and out of the chair. Sleeper chairs are diverse and come with numerous features. Looking at some of the necessary criteria helps to make your choice about which one is best easier. These chairs adjust to different levels. For example, some can lie completely flat while others provide multiple levels of elevation. The right option ultimately comes down to choice and what you find to be most comfortable. Many modern chairs have a remote control. This remote allows you to fully adjust the chair and take advantage of the different features. Other chairs might have power buttons. Consider which option is the most convenient for you. Your chair should be able to quickly and comfortably accommodate your weight and height. Check the specifications to see what the limitations are concerning these factors. Another size consideration is where you are going to put the chair. If you have limited space, a wall hugger may be a viable choice. You can place these within a short distance of a wall without negatively impacting their adjustability. Measure the space where you will place the chair. From here, it is easier to find one that will fit without limiting the chair’s overall functionality. For added comfort, some chairs provide massage and heat. This feature can help to soothe arthritis pain, and similar discomforts, such as sore muscles. These are typically adjustable, allowing you to use the most comfortable level of massage and heat. You may be able to use both heat and massage together in some chairs for maximum comfort. Most chairs will be either microfiber, leather or a combination of fabrics, such as acrylic and polyester. For seniors, fabric that is easy to maintain is ideal because this offers convenience and makes it easier to keep the chair clean. Stain resistance is crucial, and it comes with microfiber and with polyester and acrylic combinations. Leather tends to require a little more maintenance. However, it is strong and can stand up to frequent use and wear. For the padding, look for a foam with a high density. This material keeps its shape over time, reducing the risk of abnormally high and low areas. High-density foam is also not prone to crumbling, compressing or reshuffling. Use this information to get the critical information about sleeper chairs, and to learn about the best options. Consider your needs and preferences to make the right choice. Taking all of these factors into consideration remember you will likely spend the majority of your day in this chair, especially if you have limited mobility or are recovering from any sort of hospital stay. You’ve made a hefty investment in buying a bed in the past, why wouldn’t you do the same to ensure your comfort and ease when buying the perfect sleeper chair?